You can often sense it before it arrives on the calendar. Your bike knows it too. Crisp autumn air, the crunch of a few fallen leaves and suddenly it’s Fall. Some of the best riding is right before your eyes, and throttle. The Ontario’s Highlands region cuts a swath smack dab through the heart of massive tracts of deciduous forests. This includes many fall colour rock stars, such as Algonquin Park, The Ottawa Valley, Haliburton Highlands, Bon Echo and Bancroft. Our handcrafted roads wind and twist their way through Mother Nature’s big show. This is the perfect time to layer up, slow down, take a deep breath, and maybe even take a few pics of you and the steed. Fall riding is, hands down, our favourite time of year to ride. Here’s how to maximize your next adventure when Riding the Highlands. 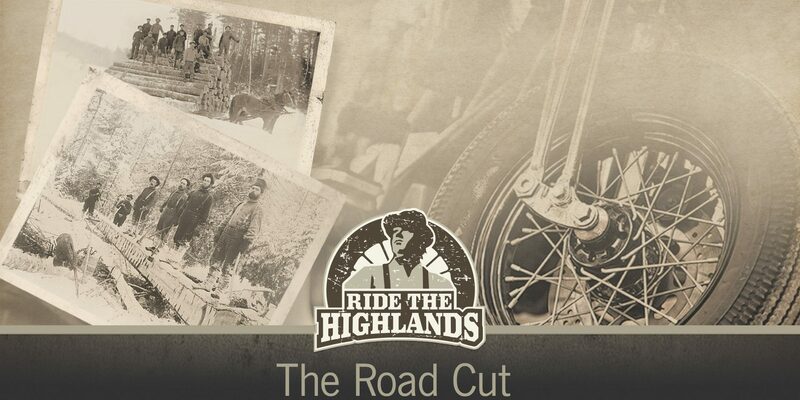 With so many of the top Ride the Highlands routes and roads winding their way through back-country and touching Ontario Parks, you better believe that you’re going to see some awesome iconic Canadian scenery. The best time to ride and capture fiery red blazing maple leaves is mid September through October, but with the fall colours being heavily influenced by the weather, the season can sometimes last a few weeks longer. Be sure to check out Ontario Parks online Fall Colour interactive map before you head out to find out where the changing season is taking place across the province, throughout their parks and on your riding routes. Here’s a sample of some of the best routes and rest stops, which will provide the perfect riding weekend for you and the crew on your Ride the Highlands Fall colour adventure. Consider this route for a great turkey long-weekend ride and enjoy using that extra day to experience the entire loop. This route has killer views meandering around lakes on some legendary roads-like the Opeongo, Old Barrys Bay Road and Centennial Lake Road. It took a lot of dynamite to create this epic route just so you could ride it in the height of the fall colour show. Rock cuts, scenic lookouts and lots of small town charm dot this ride. Plan a weekend to go rafting with your riding buds. Not only will the ride there be stunning, but a float down the Ottawa River will give you a whole other perspective on Fall. Rafting on the Ottawa River with Owl Rafting, River Run Rafting, Wilderness Tours or Madawaska Kanu Centre. This giant figure 8 loop winds its way over the historic waterway of the Rideau Canal and a pretty special, Westport Road. Check out the scenic chairlift ride at Calabogie Peaks Resort to the top of Dickson Mountain for a mind-blowing view of the fall colours. Visit on October 6th for the Festival of Fall Colours where local artisans from across the Ottawa Valley showcasing their unique craft. Chairlift rides available October 6, 7, 8, 13, 14, 20 & 21, 2018. Need a break from all that colour? Head underground and check out the Bonnechere Caves for a different perspective on the Canadian landscape. Check out Golden Lake on the top of the loop. Be sure to drive over to Ride the Highlands.ca to plan out all the details for your best Fall Colour Ride yet and enjoy an iconic Canadian Ride through The Highlands.